Calvary Chapel has been using WordPress for several years and we wanted to keep the momentum going with this redesign. One of the major goals of the new site was to allow church staff to design promotional graphics for events and activities and incorporate them into the site in addition to adding events, news and other textual content. For this project I started with the Aperture theme from Woo Themes (affiliate link) and then customized the design and developed new widgets and along with other PHP enhancements. We wanted to keep the design framework minimal but feature the colorful promotional images that Paul Funk (J.P.), our creative assistant pastor, creates week after week. The Aperture theme was designed for a photo blog and that worked out great to feature the image links on the home page which draw site visitors in to find out more. Many of the church family members have been using Facebook, including the pastoral staff. It has been a great way to keep in touch with people here in Miami but even more so as a way to stay connected with those who have moved away. Calvary Chapel Miami Beach is in a “transient” community and we see many people come and go. If you come to our church and then return 6 months later you will find many new faces. The logical next step was to create a Facebook Fan Page for Calvary Chapel Miami Beach. Pastor Robert Fountain updates the page regularly to let people know what’s coming up and to share devotional and encouraging messages. 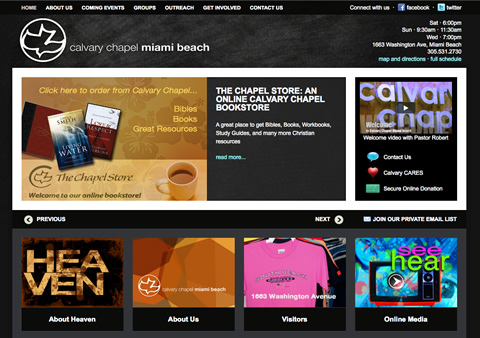 We hooked up the Facebook page to the Calvary Chapel Miami Beach Twitter account. The twitter posts are really links back to the public Facebook page. We have found this to be effective since it expands our audience to the general Twitter community but makes it easier for us to post on Facebook. The custom theme features in-site integration of our Facebook feed as well as an embedded Google Calendar for our events. It was a definite win to use Google Calendar for managing our schedule. 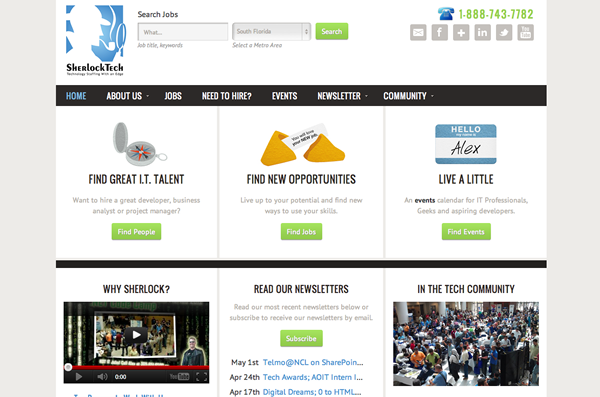 With a little bit of tweaking I was able to get it into a widget on our site footer. Lastly, we started using MailChimp for our email newsletters and mailing list management. MailChimp has an API that we use to allow people to subscribe right from the website and also manage what groups they are interested in. The new site looks better and is easier to use. But the major change we have seen is improved communication with our community. Using WordPress and social media has allowed me (geek) to get out of the way and allow the pastoral staff to do the communicating themselves. I think I did my job right this time. It has been a pleasure working with Anya Ciecierski of CAL Business Solutions and David Foreman or Interactive Limited to launch the ERP Software Blog. The ERP Software Blog brings together a group of experts nationwide to assist financial professionals in the ERP/Accounting software selection process. Read more about the project on my projects page. Last night Refresh Miami had its monthly meetup, this month at the Kelley Roy Gallery near Midtown Miami. Refresh is a community of web, technology and social media enthusiasts that was founded in 2006 by Brian Breslin and Alex De Carvalho. You can find out more about the larger global community at RefreshCities.org. Social media is not about the platform, it’s about the people. Coworking is not about the space, it’s about the people. So, consider the benefits of coworking and get involved. If you’re not familiar with Brikolodge then you should be. Brikolodge is Miami’s first coworking facility and it’s run by Ali and Eduardo, two very friendly people who embody the ideal of sharing. LaidOffCamp & FreelanceCamp Coming to Miami! Next up at the event was a brief announcement about LaidOffCamp Miami and FreelanceCamp, two BarCamp-style unconferences that I hope to bring to South Florida. The idea is to have an event where freelancers, independents, startups and job seekers can come together, share ideas and opportunities; bottom line…find work. Please follow @LaidOffCampMIA and @FreelanceCampFL for updates and RSVP for the May 15 event on Facebook. Finally, we had a presentation at the event by Craig Agranoff and Herb Tabin from VOIS.com. VOIS.com is a social networking site that is all about connecting people who need projects done with those who can help them. VOIS stands for Virtual Outsourcing is Social. They call their concept “Global Social Sourcing” which combines a lot of the best features of social networking and freelance bidding sites and helps you build long-term relationships for business around the world. Visit VOIS.com – Social Networking for Freelancers, Outsourcing and Coworking! This was my first time at Refresh Miami and I’m glad I finally made it. Thanks Brian, Alex and the rest of the community for a splendid evening. Barcamp Miami & WordCamp Miami FTW! I was glad to be a part of BarCamp Miami 2009 which also included WordCamp, a track dedicated to WordPress. Hundreds of geeks descended on Coconut Grove at the Anokha Restaurant and the Mayfair Hotel. I admit I was a little skeptical about how this was going to work out. It was my first unconference and I am not generally of the opinion that things “just happen”. You need leadership and fortunately we had some leadership with the visionaries who brought BarCamp to Miami, namely Alex De Carvalho (@alexdc) and the rest of the BarCamp team. There were many volunteers who helped make the event a success. Thank you. So, the way this gig started was with a big slab of paper on a wall with time slots. People rushed to put up post it notes with the presentations they had prepared. This was the part that had me nervous. I had ominous visions of an American Idol tryout for geeks. It turns out many of the presentations turned out to be quite good.Â Here were my favorites. David Bisset (@dimensionmedia)Â introduced us to BuddyPress.Â I’m very excited about BP and am thinking of using it for a community site for solo entrepreneurs at Solo Startup. Jim Turner from One By One Media (@Genuine) spoke on Blogging for a Living and did a live web broadcast of Social Mediasphere on Blog Talk Radio once he got the wifi working. John Carcutt (@johncarcutt) gave an information-packed session on WordPress SEO that confirmed what I have learned and taught me lots more about SEO for WordPress. Finally, Jay Berkowitz (@JayBerkowitz) and Alex Harris (@alexdesigns) gave a super session on tips for using social media increase traffic to your site. There were many other sessions that I did not attend but I heard were very good. I hope to see some of the info online after today and maybe I’ll link up to some at that point. The best part about today was that I was able to meet several people whom I had gotten to know “virtually”.Â It’s always good to have some face-to-face to strengthen a relationship.